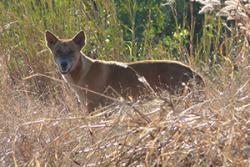 Dingo in Kakadu National Park, in Australia's Northern Territory: image credit & copyright:Peter FlemingHow Australian naturalists manage dingoes is both a longstanding and current hot topic on that continent. As well as building the world’s longest fence to keep dingoes out of Australia’s sheep grazing areas, conservationists have argued about the dingo’s role as apex predator. The arguments have ranged around the extent that dingoes should be controlled and the effect that controlling dingo numbers is having on introduced species such as cats and red foxes. These in turn are decimating Australia’s smaller indigenous mammals. Arguments have raged about whether or not dingoes should be culled and how far they are useful in safeguarding threatened smaller fauna, as they prey on the larger cats and foxes. While the Australian wildlife services are spending thousands on other means of controlling non-native species, without achieving great results, there is evidence that maintaining dingo numbers benefits the smaller mammals. A paper in the Journal of Applied Ecology (doi: 10.1111/1365-2664.12250 published 10 April) urges all the participants in what has been, at times, a heated debate, to lay down their differences and get back into the field to collate the robust data necessary to provide certainty for management action. Lead author and Australian, Matthew Hayward, a lecturer in Conservation at Bangor University (Wales, UK) says that before any further decisions are made, there should be some more robust data collection and methodology agreed. He suggests that both sides of the argument are using flawed methodology to enumerate the number of mesopredators, in this case, introduced red foxes and feral cats. Dingo: image credit/ copyright John TraceyThese mesopredators are having a dramatic effect on the smaller native mammals, and arguments rage between culling dingoes and allowing them to coexist, thereby controlling the numbers of mesopredators. Much of the currently published scientific research uses data based on footprint detection, without actually validating their estimates. Hayward points out that this is an unreliable method: just because footprints aren’t seen does not mean any given species is not present any more than five cat footprints would prove the presence of five cats. Another frequently used methodology relies on trail-based surveys. The majority of apex predators follow trails, while mesopredators avoid them in the presence of apex predators, but if the apex predator is removed, then this behaviour changes. Hayward and co-author Nicky Marlow of the Woodvale Research Centre, Department of Environment and Conservation, Western Australia argue that there are plenty of evidenced papers that show that reliance on unvalidated indices of abundance have led to major problems in conservation throughout the world. Hayward argues that the data and methodologies currently being used in the debate are insufficiently robust. 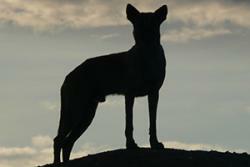 This lack of robust evidence means that the conservation managers are unlikely to use dingoes to control mesofauna for the benefit of the smaller mammals. Hayward suggests methods which would provide more robust population size and interaction evidence which could be used.